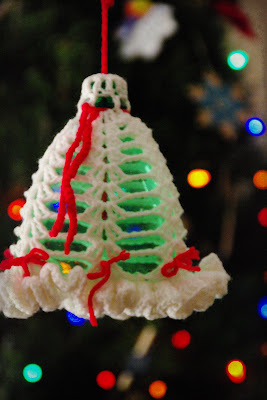 Each tree is adorned with twinkling lights and beautiful ornaments, the garlands and wreaths are hung with care and Christmas seems to be everywhere in our home, but our decorating is just not complete until my crocheted Christmas bell that my beloved Grandma made is placed on the fan pull in our living room. For years, my DH complained that it looked out of place and didn’t go with my Christmas decorations, and each year I would proclaim that Christmas wouldn’t be complete with this not getting center stage. So each year, I hang this in a place of honor, a place that I see each day, so a piece of Grandma is with us through the holidays. Do you have something like this? I would love to hear! Loved your story about your grandma. I can see why that bell takes center stage!! The sentimental ornaments are the very best ones! Some ornaments are just meant to be kept forever. Fun to see you again- thanks for stopping by! Those are the things that really matter, Sheila. That really touches my heart! I have oak ornaments my Dad made and they are a must have. Every time I hang them, I remember and miss him. What a sweet memory. I don't think I have a similar item, but I do, without fail, listen to the same Christmas music, and album of my mother's (now on DVD) of 1950's music while I decorate the tree. I couldn't decorate the tree without it. you are so right. that ornament made for you with love deserves center stage. enjoy.